Robeez Goes with Everything Socks consists of white, charcoal grey and navy socks. Each sock has navy stripes around the ankle and toe. My adorable son has cankles, but these socks work! My little fella is quite average size, but his ankles are massive, haha. No high-top shoes for him! I've bought four sets of socks for him by Robeez that have these particular ankle elastics. They are tight-fitting, yes, but in a good way. They stay on his feet and don't slide down or fall off like every other brand we've tried. His skin isn't red and he doesn't pull at them like he would if they were uncomfortable. My only small complaint is that the elastics do tend to come loose a little bit after a few washes (hanging off the sock). It doesn't affect the sock functionality itself, but the elastic strings need to be trimmed.. I'm sure they'll continue to last like they have!! Thank you, Robeez!! I have bought only Robeez socks for my baby grandchildren. They have been excellent! one is a regular two year old. 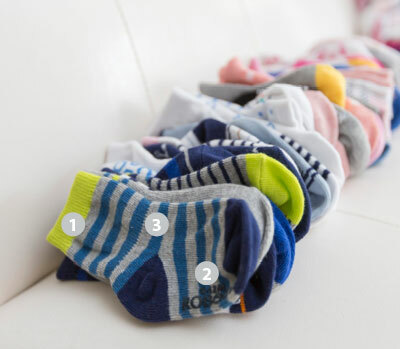 These socks are much too tight around the leg on both children, to the point of being unusable. So disappointing! I will be returning them.